When Sara was newborn her parents left her at the doorstep at Mr. and Mrs. Schneider's house. When Sara was twelve her real parents came for her and took her with them to live like the Gypsy that she was - or Romani as they like to call themselves. They told her she was going to fulfill a prophesy. That it was once said that out of the Romani people the greatest sorceress who had ever lived would be born. When Sara was thirteen she had a baby brother and when she was fourteen he got very sick with a strange illness. To save her baby-brother Sara sets off on a quest to find his cure - well knowing that it will cost her dearly. Soon Sara finds herself going through the Singing Cave, crossing Wild Witches Valley, talking to a ten foot giant snail, rescuing the Beads of Souls from the Hell-hounds, escaping a spell in Vamila, the Forest of Vanity, visiting the king at the City of Lights before she finally reaches the Black Castle where she is told the Eye of the Crystal Ball can tell her how to cure her brother's strange illness. This was an awesome book. I know just the student to recommend it to. When Sara was born she was left on Mr. and Mrs. Schneider’s doorstep. She didn’t exactly fit into the family which was just as well. She developed telekinetic abilities. She was able to move things around when she got angry. Then her parents came back for her when she was twelve years old. It was like she knew she was where she belonged. She was a gypsy and her parents had come to get her so that she could fulfill a prophesy. Although this is a fantasy novel, it reads like real life. That is a compliment to the writing style of the author. Sara meets Manolo who travels with her to find a cure to help her baby brother. Without it he will die. Her mother has warned her against getting mixed up with evil magic. Sara sees this as the only way to save her baby brother. 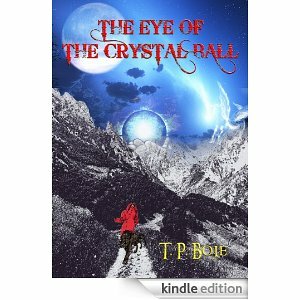 The book she searches out tells her that she needs to find the Eye of the Crystal Ball to help her find what she seeks. Sara has been told there are consequences but she is willing to accept them if it means saving her brother. Each obstacle that Sara and Manolo encounter is solved with a lesson learned. I enjoyed each obstacle because the author mixed it up. Some of the obstacles turned out to be funny while others were scary in nature. I enjoyed the book so much that I purchased her book, “One, Two, He’s Coming For You”. This is an author I think my students who love fantasy will really enjoy and one I am pleased to recommend to them.